There are also a series of issues that could derail future relations. India's controversial Cold Start doctrine, which is considered offensive and specifically directed at Pakistan, has been criticized by and hampered relations with American military commanders.62 Beyond doctrine, Indian military modernization has been driven by its relationship with the United States, which has the potential to upset regional power dynamics with Pakistan.63 With respect to Indo-Pak problems, the United States has maintained that the issue of Kashmir should be resolved through negotiations.64 Other challenges to future India-U.S. relations include India's continuing acquisition of arms from Russia, the relative closeness of U.S.-Pakistan relations, India's refusal to sign CISMOA or LSA, and potential strategic differences with regards to a rising China. President Barack Obama shaking hands with Prime Minister Narendra Modi. Although India purchases more weapons from the United States than they do from any other country, India remains the top purchaser of Russian arms. With tensions rising between Russia and the United States, India could find itself forced to choose between suppliers in the future. Lastly, the domestic politics of both countries could affect the relationship. A failure to adequately address domestic instability could lead to mass uprisings, and thus complicate relations with the United States. Moreover, in the wake of two long and unpopular wars, the United States' populus is wary of any foreign engagements. India is not the only regional partner for the United States, but it holds the greatest prospects for increased strategic collaboration. President Obama has endorsed the prospect of India having a permanent seat on the U.N Security Council. This move was met with wide applause but remains only a sentiment.70 As the 21st century unfolds, India has been moving closer to the United States while simultaneously promoting a multipolar world.71 It remains to be seen how exactly leaders in both countries will move forward from a transactional paradigm to a more strategic one, as India neither seeks nor wants official "allied" status with the United States.72 However, there are myriad opportunities to foster defense familiarity and a closer working relationship. Defense relations could fluctuate with politics. Despite this, India's unique position in the region will continue to provide common ground upon which to build upon the partnership. In September of 2014, President Obama and Prime Minister Modi agreed to "revitalize the existing partnership and find new areas for collaboration and mutual benefit."73. Successfully fostering the U.S.-India defense relationship will continue to be strategically crucial for both countries as they look to combat Chinese aggression, piracy, terrorism, and the trafficking of narcotics and weapons. The United States' pivot to Asia will depend on it. Latif, 12, and Cole, Steve. "U.S., India to Collaborate on Mars Exploration, Earth-Observing Mission." NASA. NASA, 30 Sept. 2014. Web. 17 Nov. 2015. 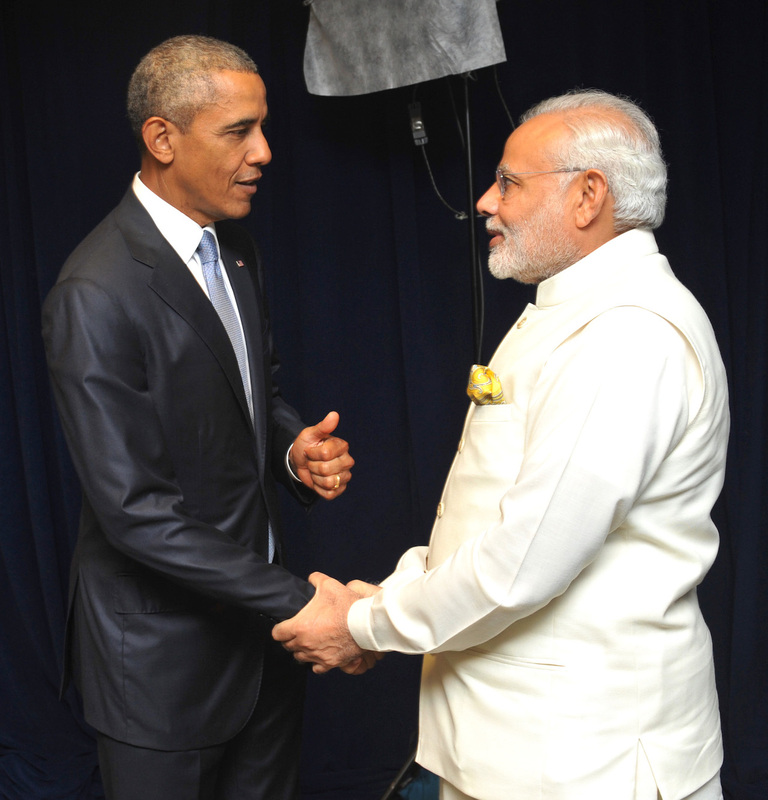 By Narendra Modi (sourced from PM in US) Prime Minister Narendra Modi meeting US President Barack Obama in New York.jpg 2015 [CC-BY-SA-2.0 (https://commons.wikimedia.org/wiki/File:Prime_Minister_Narendra_Modi_meeting_ US_President_Barack_Obama_in_New_York.jpg)], via Wikimedia Commons. By Pritishp333 (Own work) Indian Air Force C 130J Super Herculus at Aero India 2013.JPG 2013 [CC-BY-SA-3.0 (https://commons.wikimedia.org/wiki/File:Indian_Air_Force_C_130J_Super_Herculus_at_Aero_India_2013.JPG)], via Wikimedia Commons.